A prototype of Terrier - the Ј300 million combat engineer vehicle under development for the Army by BAE Systems - was officially unveiled by Minister for Defence Procurement, Lord Drayson, today at BAE Systems, Leicester. Designed to withstand mine explosions, small arms fire and artillery while digging trenches or clearing obstacles for the infantry, Terrier will become a vital tool for the Royal Engineers when it enters service towards the end of the decade. It will be equipped with a machine gun for self defence but can even be entirely operated by remote control, should the area it needs to work in be initially too dangerous for troops to enter. As well as being able to operate under fire, terrier will also be equally important for peacetime operations, and by replacing its mine plough with a fork lift will be able to move supplies for troops or humanitarian aid. Speaking at the unveiling, Minister for Defence Procurement, Lord Drayson said: "Although still at the prototype stage, when it enters service Terrier will be a hugely powerful and versatile piece of equipment. It will be an extremely tough machine, like a cross between an armoured vehicle and a bulldozer, and I am pleased to see all the good work that is being done to get it into production. "Designed in Leicester and manufactured and integrated by BAE Systems in Newcastle and Barrow, this prototype clearly demonstrates the great level of skills and workmanship here in the UK." BACKGROUND NOTES: -Terrier will fill the gap between heavy engineer tanks working on the front line and unarmoured commercial equipment working in rear areas. 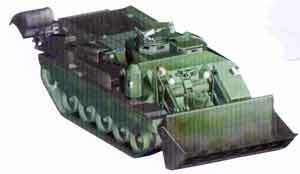 Terrier will provide the capability to clear routes, obstacles and dig defensive positions. -Terrier will be airportable within C17 or A400M transport aircraft. -Approximately 90 per cent of Terrier will be sourced in the UK. Terrier is being procured by for the MoD by the Mobility IPT at the Defence Procurement Agency, Bristol.